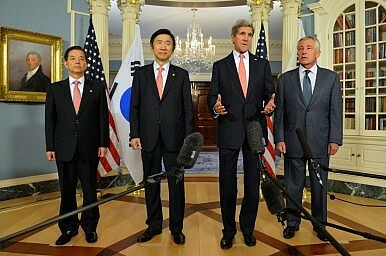 Secretary of State John Kerry said the U.S.still wants concrete commitments from Pyongyang before talks resume. U.S. Secretary of State John Kerry indicated on Wednesday that the U.S. was hoping for a resumption of the long-stalled Six Party Talks. The talks, which brought together representatives from China, Japan, North Korea, South Korea, Russia, and the U.S., began in 2003 with the aim of negotiating an end to North Korea’s nuclear program. Talks were formally discontinued in 2009. Chinese officials are very clear that they believe negotiation (whether a resumption of the Six Party Talk or another framework) is the only way forward on the North Korean nuclear issue. Even while pushing for resumption of the talks, however, China has begun to distance itself from Pyongyang. North Korean leader Kim Jong-un has not yet paid a visit to China, and Chinese President Xi Jinping chose to visit Seoul without a corresponding stop in North Korea. China’s new approach toward North Korea fostered hope in U.S. diplomats that Beijing will be on board with a tougher approach toward North Korea’s nuclear program. Perhaps in reaction to Chinese displeasure, North Korea has been more active in its outreach to other potential partners, including Japan. As part of this new willingness to interact with the world, Pyongyang might be ready to reconsider a return to the Six Party Talks. To date, this insistence on a show of good-will (some would say a concession) before resuming talks has been a sticking point. China has prodded the U.S. to give up the idea of preconditions, saying that concessions can be negotiated once all parties are at the table. Given North Korea’s track record of engaging in dialogue without any intention of altering its behavior, though, it’s unlikely Obama’s team will change their stance. Most intriguingly, Kerry dangled a juicy “carrot” in front of the North Korean government. If Pyongyang will give up its nuclear aspirations, Kerry said, “We are prepared to begin the process of reducing the need for American force and presence in the region.” China has long suggested that the key to the North Korea problem is for the U.S. to offer reassurances that its military will not threaten a non-nuclear Pyongyang. Kerry’s remarks were an indication that Washington might be willing to try this approach. That comment might have been aimed at China even more than at North Korea. As Jeffrey Bader, formerly one of Obama’s top China advisers, recounted in his book, the Obama administration liked to use the threat of an increased U.S. military presence in the region to encourage China to rein in North Korea’s nuclear ambitions. It was Washington’s way of signaling that China could best serve its own national interests by pressuring North Korea to stop nuclear development. However, the idea that the U.S. would reduce force commitments in the region is fundamentally at odds with the Obama administration’s “rebalance to Asia” policy, which calls for an increased U.S. footprint in the Asia-Pacific. It’s no surprise then that spokesperson Marie Harf attempted to downplay Kerry’s remarks a State Department press briefing. Kerry “was not indicating anything new” in his comments, Harf said. One reporter asked if Kerry’s comments indicated a new effort to entice North Korea to join talks or if the remarks were just “a reiteration of the longstanding U.S. position that over the very, very long term, if North Korea were to, as it were, change its spots, then the United States could take another look at its security posture on the peninsula.” “The latter,” Harf responded. The State Department is also dispatching its Special Envoy for Six-Party Talks, Sydney Seiler, to the region next week. He will meet with senior officials in South Korea, China and Japan. Time for ‘Implementation Diplomacy’ on North KoreaNorth Korea, South China Sea Dominate US-China TalksAhead of Kerry Visit, China Doubles Down on North Korea PositionSouth Korea's President and China's Military ParadeAfter Iran, North Korea Next?